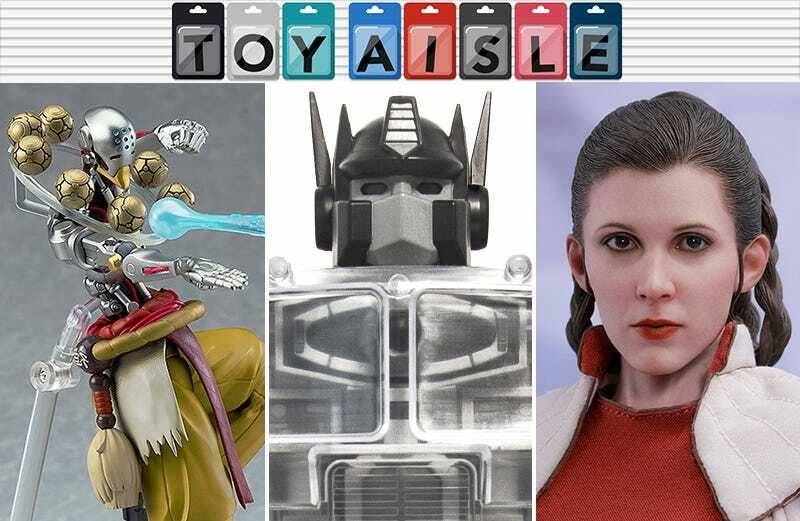 Welcome back to Toy Aisle, io9's regular round up of the coolest merchandise we’ve seen on the internet. This week: RIP Optimus Prime! Plus, a very good Princess Leia, Wolverine goes ronin, Overwatch’s divine robot monk gets the figure he deserves, and much more. Check it out! Hot Toys’ collection of Princess Leia figures has expanded with a second entry based on The Empire Strikes Back—we already got Leia as she appeared commandeering forces on Hoth (some would call that the best Leia! ), and now we have a more regal version of her in her Bespin “This Dinner is Absolutely, 100 Percent Not a Trap” formalwear. Leia didn’t get to actually wear this look for very long, but Hot Toy’s exquisite recreation of the dress is still delightful, as is the stunning likeness of Carrie Fisher with her looser braided hair. Don’t worry, your browser hasn’t suddenly lost the ability to display colors. Available exclusively at the upcoming New York Comic-Con is this 12-inch, $75 figure from Super7 commemorating the most traumatic moment most children of the ‘80s had to endure: Optimus Prime’s death. The grayscale figure captures the moment when all the life and color drained from Optimus’ body, and it’s carried through to the collectible’s de-saturated packaging. Prime’s chest plate is also removable, giving access to the Matrix of Leadership so that it can be passed on to Rodimus Prime...possibly the second most traumatic moment children of the ‘80s had to endure. Following up on its beautiful sixth-scale Tyrion Lannister figure, Threezero recently teased its upcoming Game of Thrones Brienne of Tarth collectible featuring not only a fantastic sculpt of Gwendoline Christie, but a detailed suit of armor and the Oathkeeper blade. Pre-orders will soon be made available, and you can expect to invest (that word’s nicer than the phrase “drain your wallet,” right?) north of $200 on this one. Board games like Sorry!, Clue, and Operation have immense replay value, which is why they’re considered classics and have been around for decades. But if you’ve ever tweaked the rules just slightly to make game night more interesting, you’ll appreciate the humorous updates Hasbro has made to these parodies of classic titles. Clue: What Happened Last Night? Lost in Vegas has six players trying to find out what happened to a missing friend after a night in Sin City; Botched Operation has amateur surgeons trying various stunts while trying to perform surgery; Game of Life: Quarter Life Crisis has you competing with friends to see who can pay off a $500,000 debt first; Mystery Date: Catfished introduces a modern pitfall to the classic dating sim; and Sorry! Not Sorry! introduces an element of truth or dare as pieces move across the board. All five of the games will be available starting October 1 for $20 each. When it comes to action-figurable characters, Wolverine ranks right up there with Iron Man when it comes to the number and variety of collectibles available. Any why shouldn’t he? Having lived for almost two centuries, there’s the potential for a lot of cool historical costumes, including this katana-packing samurai outfit from Peter Milligan’s reimagined 5 Ronin Marvel comic series. Mezco Toyz manages to pack 28 points of articulation into its new 6.7-inch Wolverine, as well as a pair of swappable heads featuring distinct grimaces. The $85 figure comes with two katanas as well, and a wire-reinforced scarf so you can create the perfect wind-blown pose. Figma’s line of highly articulated characters from the world of Blizzard’s popular superheroic team shooter Overwatch has so far focused on the more aggressive and action-packed stars of the game’s roster: aggressive attackers like Tracer and Genji, or front-line tanks like D.Va. But its latest figure in the line is an action figure for a character best known for not really getting into much action at all, because he’s an enlightened robot monk. Appealing to both fans of eco-friendly energy alternatives and devoted collectors who need to hunt down even the rarest of sets, Lego’s new Creator Expert Vestas Wind Turbine will be available to anyone starting on November 23—aka Black Friday. The 826-piece set stands almost 40 inches tall and was originally created way back in 2008 for Vestas as a way to promote the company’s turbines. The new version features the same powered-functions, but is the first set to include Lego’s new “Plants from Plants” pieces made from plastic derived from sugarcane plants.